In case you haven't caught the exciting news, our products - the Edible Ink Starter Kit with Canon MG5550 A4 with Scanner Value - are going to feature on Saturday morning's Weekend Kitchen! The popular cookery-based TV programme features presenters Steve Jones and Lisa Snowdon, but with the welcome addition this week of master patissier, Eric Landard. With some help from our edible ink products, Eric shows us how you can utilise such tools to really enhance your baking. If you'd like to get a head start on the show, you can check out our range of edible ink products here. Otherwise, make sure you tune in to Channel 4 at 9.00am this Saturday to see our wondrous ink in action! We've got some very exciting news from the City Ink Express offices this week - and that is that some of our fantastic products are being featured on National Television! 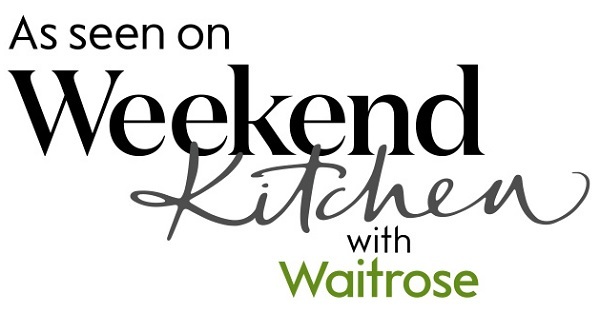 'Weekend Kitchen with Waitrose' airs Saturday mornings between 9:00 and 10:00am on Channel 4 and on this week's episode (Saturday 4th October) our Edible Ink Starter Kit with Canon MG5550 A4 with Scanner Value Kit will feature alongside presenters Steve Jones and Lisa Snowdon. Saturday's episode of Weekend Kitchen with Waitrose will contain a section on cake decorating with master patissier Eric Lanlard, and edible printing features as part of this. With our range of edible ink and edible ink printers you can decorate your baked goods with precision and flair, really taking the quality of your cakes to the next level! With edible ink printers you can use a variety of different papers including edible wafer papers, icing papers and even some delicious choco icing papers! These will make your fantastic creations come to life in a delicious edible way. Anyone who enjoys baking and would love to explore taking their creations to the next level should look at our edible ink products and see City Ink Express can help transform your baking. Tune in to Weekend Kitchen with Waitrose on Channel 4 this Saturday 04th October at 9:00-10:00 am for some fabulous recipes and foodie ideas, and of course to see our fantastic edible ink starter kit in action! Putting your Edible Ink to Good Use! If you're purchased any of our edible ink products or treated yourself to an edible ink printer bundle from City Ink Express then by now you should be pretty efficient at making delicious and beautiful images to top yummy cakes and other treats. We strive to offer an extensive variety of products to our customers, which is why we've stocked up on multiple products to help you take your baking skills to the next level. Our range of animal moulds make fantastic, fun and delicious edible goodies which can be enjoyed by your whole family! They make great personal gifts, additions to children's parties and turn baking into a fun and exciting activity for anyone to enjoy. We are one of the UK's leading suppliers for animal moulds and have thousands in stock, so a whole world of fun is just one click away! Our fun silicone moulds can be filled with chocolate, fondant, ice, jellies, sweets, candies, soaps, resins, mousses, pates and wax meaning our animal moulds are extremely versatile and the fun animal shapes can be enjoyed in a number of ways! Three of our most popular animal moulds are shown below, but for a full list of the animal shaped silicone moulds available from City Ink Express just click here. Once you've baked some delicious animal-shaped goodies why not use your edible ink to add images or text to your creations and take your baking to the next level? When you combine our edible ink and animal moulds the possibilities are literally endless! Edible Ink allows you to create beautiful and edible decorations for cakes and other confectionary. It uses edible ink to print images on to edible paper, which then dissolves images on to your desired confectionary, providing you with a professional and personalised finish. If you consider yourself quite the cooking connoisseur and want to take your goodies to the next level, then we offer a number of edible ink starter kits for you. Alternatively, if you’re well accustomed to edible ink we offer some fantastic premium edible ink kits for you to sink your teeth in to! All of our edible printer bundles come with gorgeous template images to get you started with – so get baking! These are just 3 of our fantastic edible ink printer bundles – we have several more on offer for you to choose from! If you’ve already got the printer, we offer a fantastic range of edible ink products for you to stock up on too. One of City Ink Express's many specialities is edible ink. Some of you will be thoroughly educated on this marvellous invention, but unless you are planning to or already have personally used edible ink products, it's highly likely that you didn't know such a thing existed! This is where City Ink Express come in handy. In this blog post we're going to attempt to answer any possible questions you might have regarding what edible ink is, and then run you through which edible ink products we have available here. As always, if you have any questions what so ever then please don't hesitate to get in touch with us! 1. What is edible ink? Edible Ink is printer ink which is actually edible (unsurprisingly). It consists of different edible food colours and edible ink can actually be placed in special edible ink printers, or even in some inkjet or bubblejet printers. Edible inks are flavourless and will not impair the taste of your food. Edible Ink is used to print images onto special edible paper which is then used on or in various confectionary. Edible paper dissolves when it comes in contact with a moist surface, but it maintains a high resolution. So any images you see on cakes or cupcakes were made using edible ink and edible paper! You can use edible ink on various pastries, cakes or cookies and if you get some edible ink and edible paper you can create amazing and professional looking confectionary within the comfort of your own home! 3. What edible ink products do City Ink Express offer? Now we've enlightened you and filled you in on the wonderful world of edible ink, which of these amazing products can you purchase from City Ink Express? Edible inks are primarily seen used in the food industry to create unique edible photos for cakes and cupcake toppers. All of our edible ink products are food safe and comply with EU food hygiene regulations, and each bottle comes with a use by date. We offer bulk ink refill kits to keep printing costs low. You can buy big bottles of edible ink in various colours, or bulk packs with a few different colours available. To buy in bulk is far cheaper, and ensures that your professional looking home goodie factory can keep running for longer! 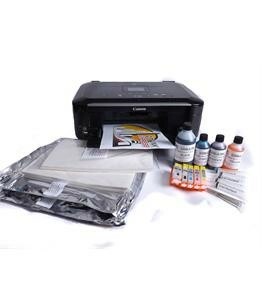 Our edible ink refill kits are fantastic and contain compatible edible refill printer cartridges, edible printer ink and edible photo paper. Our compatible edible ink cartridges and edible inks for Epson and Canon printers are all food safe. Our edible ink refill kits all come with easy, step-by-step instructions which are specific to your printer on how to refill your cartridges. We lave lots of different bundles to fit specific Canon and Epson models, which you can browse by clicking the above link. You might be well stocked up in edible ink, but unless you've got edible paper to print it on then it's not much use is it? It can be used as normal paper, you just pop it in your printer and as long as you've got edible ink then you're good to go! We offer a variety of different types of edible paper from rice wafer papers to edible decor papers, we've even got pre-cut decor paper for you to pop on to your delicious treats! 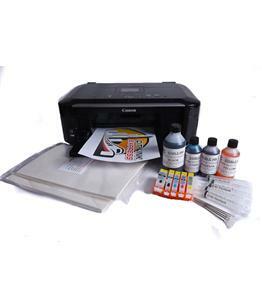 Our edible ink starter kits contain everything you need to start printing gorgeous edible pictures. We've got a variety of different printers to choose from (all varying in price of course), and each edible printer bundle comes with your chosen printer, compatible refillable ink cartridges, 550mls of edible ink and 50 sheets of wafer paper! Essentially, our edible ink starter kit is all you need to create stacks of yummy treats! So what are you waiting for? Order your edible ink goodies from City Ink Express today!